Bohemian Marley design is for a bride who wants a little whimsical magic in her day. 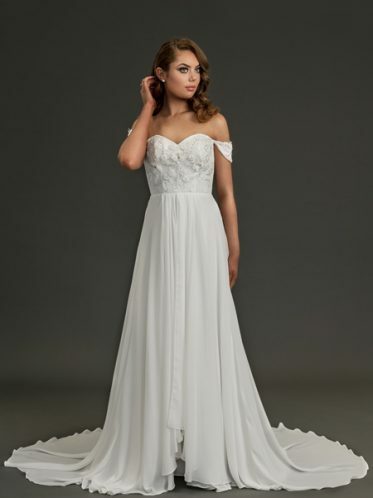 Whats not to love, from the leaf and vine pattern underlay lace to the soft flowing sleeves. Designed for the girl who believes less is so much more. Especially important if you are having a destination ceremony! Perfect for an outdoor wedding, garden, festival, country or beach wedding day vibe. How gorgeous is this dress in the Blush and ivory combination! You can also choose ivory or white. The back of the bodice, we have left as an illusion back so the fabric is see through. The ivy like pattern lace is just visible creating a dream like vision. and the soft flowing skirt falls like a cloud over the hip line. This is a long sleeve wedding dress style with a soft A-line skirt. 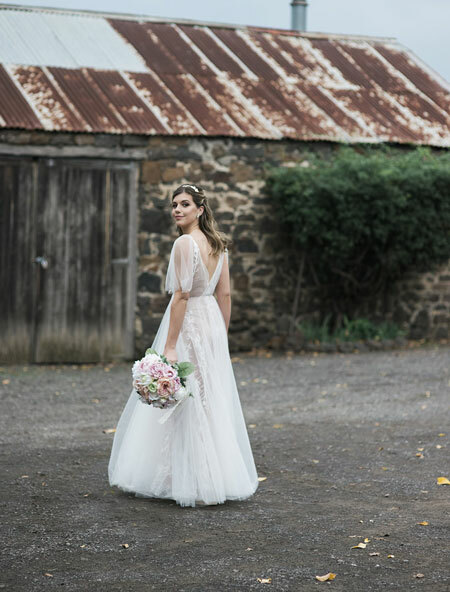 Leah S designs is a Melbourne bridal shop that stocks many different styles bridal dresses to cater for all tastes. At the moment there are many colored gowns to choose from in store. Check out the pink wedding dresses the spring time is a ball gown style gown. Also the Erica also a soft A-line style gown. Off the rack wedding dresses available for purchase now. We have matched the Sydney dress ring in gold and the Daylesford earrings also in gold. 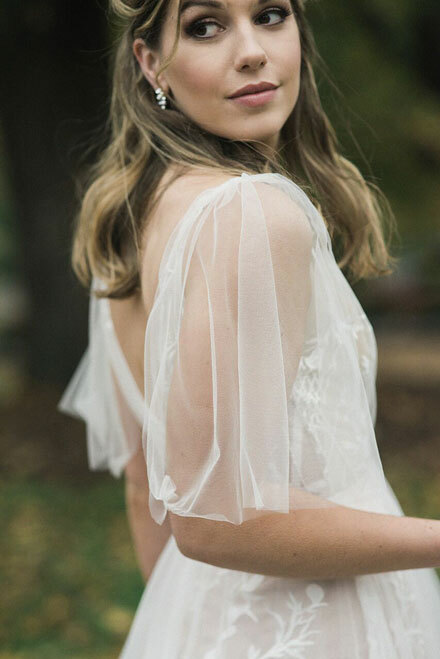 A blusher veil would also look seriously stunning with Marley boho style. Worried about Alterations? don’t be, we have on site Alterations by Ginger pins, Amy can shorten your dress, take it in, even remover the sleeves if you don’t like them. Marley is just one of many stunning unique wedding dresses in Melbourne at Leah S Designs. Big thank you to Rachel Breier Photography and Peony Perfection for their stunning pastel wedding flowers used in the photo shoot.